Onlinestrength analyzed 25 of the best-selling intra-workout supplements in the United States. The top 10 of the 25 were chosen to be on this list. Our analysis quantified levels of 4 key ingredients in which intra-workout products were deemed effective or ineffective. BCAAs, Citrulline, Glutamine, and Taurine were the 4 specific ingredients we analyzed and looked for in these products. These 4 ingredients were chosen based off of clinical research studies conducted which showed these ingredients had the most positive influence on athletes during workouts. Intra-workout supplements are products that contain a formulation of several researched backed ingredients that can be exponentially beneficial to your body and training. Intra-workout supplements are rated solely on their ingredient formulas. Onlinestrength determined that there were 4 key during-workout ingredients that deemed an intra-workout product effective or ineffective. Primary purpose: Most critical for muscle growth. Known as the building blocks for muscle protein. Enhances muscle growth and improves performance. Benefits: Studies show that BCAAs can help promote muscle growth, improve recovery, reduce fatigue, and promote healing. Used by the body and muscles as an energy source which can lead to improved performance. L-Leucine – Encourages muscle growth by promoting greater muscle protein synthesis and decreasing muscle protein breakdown. L-Isoleucine – Increases fat burning and inhibits fat storage. L-Valine – Helps keep you energized during workouts. Muscles are work longer period before getting fatigued. Benefits: Improves blood circulation which aids nutrient and oxygen delivery to your muscles. This helps to reduce fatigue and produce more energy during workouts. Improves your ability to recovery faster in between workout sets. Primary purpose: Important for muscle recovery and growth. Anti-inflammatory. Helps you reovery faster between sets. Benefits: Plays a role in physical development. Increases leucine levels in muscle fibers, which, as we’ve already stated above promotes muscle protein synthesis and muscle growth. Capable of improving metabolic rate during exercise and while at rest. Benefits: Taurine gets used by rather quickly during exercise. This can lead to fatigue, reduction in strength and muscular endurance. Replenishing these stores will boost endurance and muscle strength. Onlinestrength based its effectiveness calculations around the 4 key ingredients we listed above. When specialty ingredients were included like beta-alanine and betaine, conversion factors were utilized to add in ‘bonus’ ratings for products that included these beneficial ingredients. Typical supplementation regimen for benefits appeared after as little as 5-7 days of consistent supplementation. Proper supplementation consistency has shown efficacy in enhancing athletic performance. Clinical studies show subjects taking a mix of BCAAs, Citrulline, Glutamine, and Taurine had a 20% increase in recovery rates between bouts of exercise and 35% more energy during workouts. BCAAs are the most popular supplement to drink during workouts, present either on its own or as part of a intra-workout supplement blend in 12 of 12 reviewed products. Improves focus which can help you get a better mind muscle connection during training. Helps keep you and your body hydrated during training which improves recovery and overall performance. 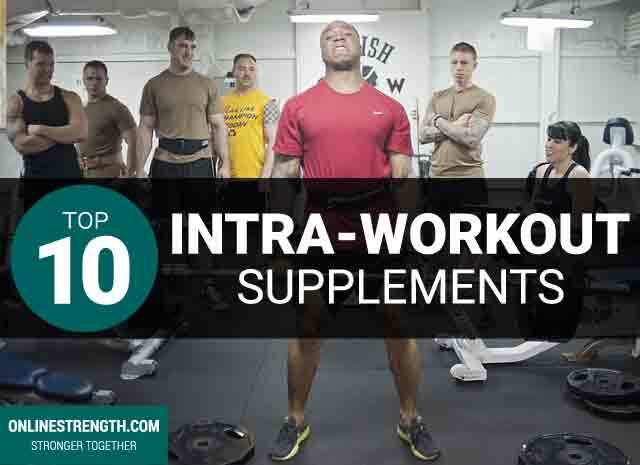 Intra-workout supplements like the top 10 we listed above are specifically designed to be taken and supplemented during the duration of your workouts. If you prefer to drink the entire intra-workout supplement at the beginning of your workouts to get an instant boost that is a good option too. Typically most athletes have a shaker cup with their intra-workout mixed in with some water and they sip on it during the entire duration of the workout. This keeps you hydrated while sending nutrients to the muscles that need it most. These supplements are best taken during your workout. Depending on the length of your typical exercise session, you’ll have to choose the best time for your individual situation. If you typically exercise for less than an hour, you may want to take your serving right when you get to the gym, so that it has time to get to work. For correct dosage and serving size follow the products instructions for best results. What are some things I need to know before purchasing an intra-workout supplement? Are there any potential side-effects that come with taking intra-workout supplements? What are the benefits of an intra-workout supplement? How can an intra-workout supplement maximize my workout?